Simply Silhouette: Jenny's B-ig! B-irthday!B-loga-versary! post in order to win some AWESOME blog candy! Let's Move This Party Along! TaDa! Here's what I came up with! Now...time for some yummy Blog Candy! Alex has in store for you! You did oh so great!! 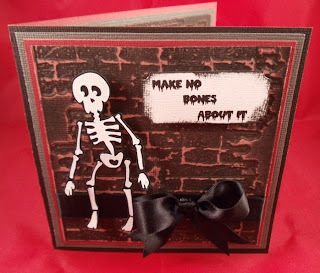 love the no bones about it! how clever!! and love your embossing!! I LOVE THE EMBOSSING! This is such a creative birthday card! Did I mention I love what you did with the embossing! It looks amazing! Wow! that is a great card! I love the sentiments that you used! Thanks for sharing and the chance to win! That brick wall is PERFECT! WoW!!! Your card is very creative. I love the embossing and that paper. Great job! TFS such beautiful inspiration. Super cute card. TFS. I'm a follower and I grabbed your blinkie. Love you card....so cute. Thanks for sharing. Love that embossing folder, what a cool card, so creative!! What a great way to use Halloween stuff for other celebrations...I luv it!! I really love this card. 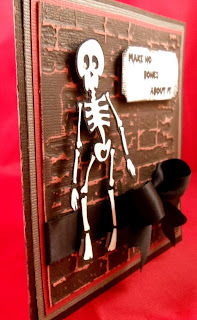 The skeleton is actually cute and I really like that embossing folder....think I'll be buying that next time I'm at the store (which is way too often!) Thanks for the chance to win some blog candy! So so cute!!!!! I can see from this blog hop that I have LOADS to learn!! LOL But, these cards and all have been so absolutely ADORABLE!!! Wow, love it! 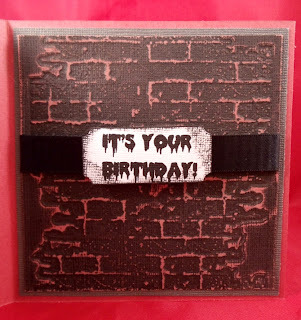 Very creative with the brick embossing folder! What an awesome card! I love the texture!!! love it! such perfect birthday card for someone who love halloween. So cute!! I love the embossing. Thanks for sharing! That's such a fun card! A great spin on the Happy Hauntings cartridge. I'm now a follower. What a cute idea for a birthday card. I have been a follower for a while and visit often. Oh I have Tim holtz embossing folders, this one is gorgeous, you can do so much with them. I have come here from cardsbycg on the blog hop. How super cute!! Love the sentiment. What a creative card. Love the idea TFS. Really great card. You did a fabulous job. Great card :) Made me laugh! Nice work! Cute idea. Your card has just given me a great idea (I hope) for a Halloween card. Thanks. Great job. Is the sentiment a stamp or just printed? Love how the background bricks came out! How fun!! Love the detail and the layers!! What a fun card! Love the skeleton! Wow, awesome card!! You did a great job putting a neat twist on the theme. Thank you for sharing. Love it!!! shannleffew2@yahoo.com I was already a follower. What a great idea for a birthday card! I never would've thought to use a Halloween cartridge for a birthday card unless the birthday was in October, but the card you came up with I think could be used any time of year. Thanks for sharing! What a fun birthday card!!! I ♥ it and I am sure that Jenny is going to as well!! TFS!!! Happy Birthday to all!!! I have been a follower for some time!! 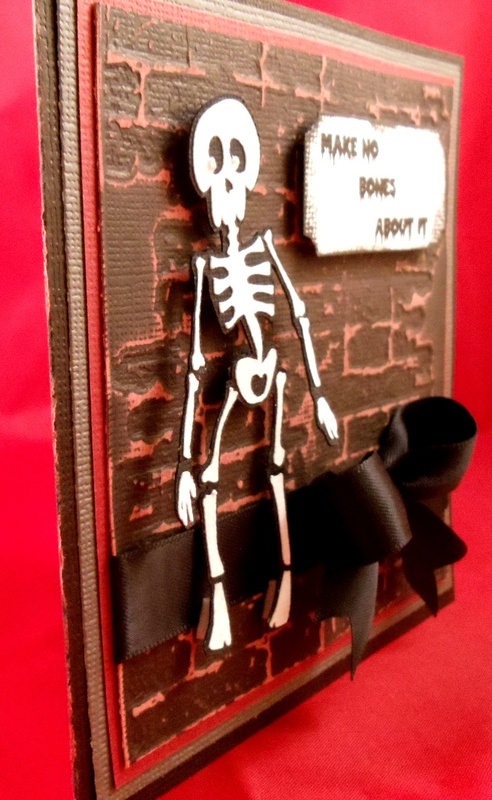 What a great card love the twist you did on the halloween card. Very nice card, love the embossing!! haha! Your card is great! I love it! Your card is so very creative!!! It's different and I like that!!! How adorable!!! That skeleton is great!! I am a follower! You have really outdone yourself again. What a great card. Super bow too !!! Thanks for sharing your talent....super blog !!! Oh wow this card is awesome! I love the brick! Ive had ur blinkie on my blog for awhile now :) Love seeing all your creations! Really great idea. I love the embossing on the card. Reminds me I really should go back and see which folders and I have start using them. Something small like that can really spice a card up. LOL not only did I have to become a follower - but I had to have your blinky!! That card is priceless!!! I absolutely love it!! It is so warped it's great! LOVE the humor behind the card! It's very cool! became a follower. looking forward to seeing what else you come up with. Cool card. THe bricks look so real! What a great (and different) birthday card! Love it! Love your card very cute,Thank-you for sharing your talent. That is such a fun card! Great idea! Oh what a card!!! Very clever and creative. Great job. Super cute card. Love the skeleton! What a really neat card! Love the chocolate and pink combo! Love the way the sentiments came out! Thanks for sharing and thanks for the chance to win! Such a creepy cute card, thanks for sharing it, and thanks for the chance to win. 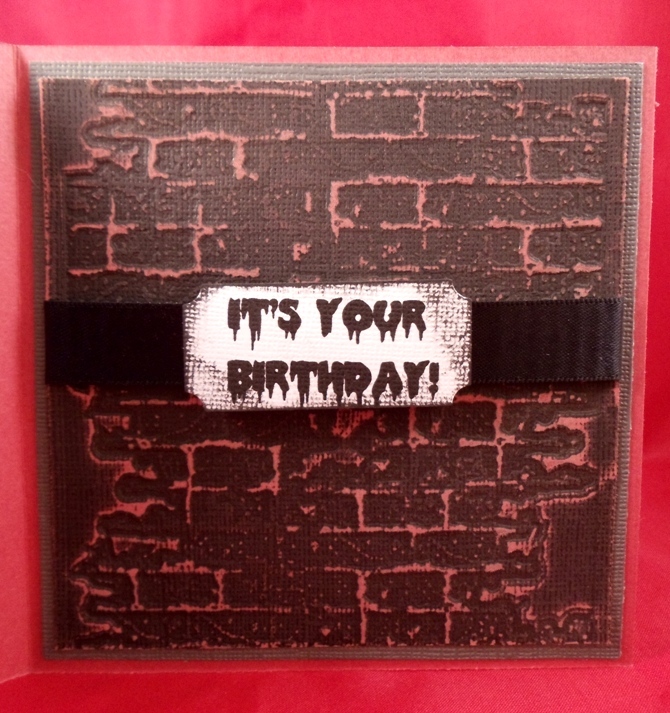 I love the brick embossing and you thought of just the right sentiments. Very creative. Thank You for sharing in the hop. I LOVE the bricks...so added to my wishlist now!! Awesome card! Ooooh so scary! Such a neat card and exactly what she wanted. Thanks for sharing your talent and hop. 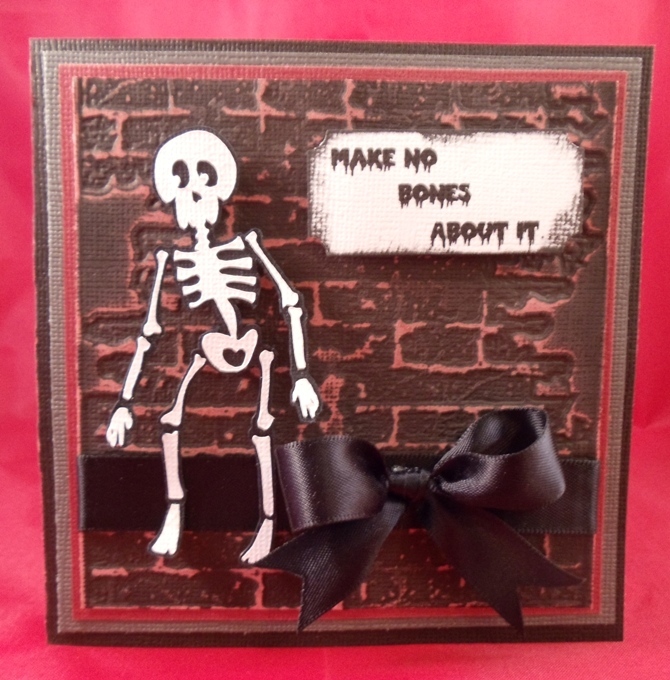 Love the skeleton!! great card!!! Wow talk about a challenge but you did an amazing job!! :) Thanks for sharing! This card is so cute! Great job. Great card! What a fantastic idea. Thanks for the inspiration. OM goodness...........that card is just too darned cute! TY for sharing. Long time follower! 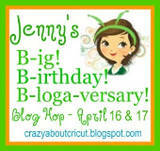 Happy Birthday and Congratulations to Jenny...It's my birthday this month too...I have blog candy also...go check it out... I'm already a happy follower. Thank you - always on the lookout for ideas for cards that aren't too feminine or too juvenile. This is a really cute card. I love the brick embossing. Such a wonderful card!! I love that embossing folder, terrific job! I love that card. I have the cart now I want the folder, thanks for more ideas on using it. I have been a follower and thanks for the chance to win. Hahaha! I adore this card! It's just awesome and I'll bet Jenny loves it too as it has absolutely everything she loves! That skeleton is adorable and the font you used for the sentiments couldn't be more perfect. Thanls for the inspiration and for a chance to win some cool new tools! Super cute card! Love the skeleton! You came up with a great solution for fulfilling Jenny's requests! What a cute and unique birthday card! Great job. Thanks for sharing! Super cool card! Great sentiment & love your bones! Lovin the skeleton. Thanks for sharing. Where did you get the embossing plate for this card?? I love it!! I can only find the cuttlebug one that looks like wood. I love how you can take a halloween cut and make it into a birthday card. Great job!! Love the embossing on this card. TFS. Already a follower. Love the card and the embossing. Jenny will love it for sure. Thank you for sharing. I love all the layers & embossing! I'm already a follower and love that brick embossing...I've never seen that folder before. Your card is so cute! I'm a new follower. I am a follower, great card, thanks for sharing. 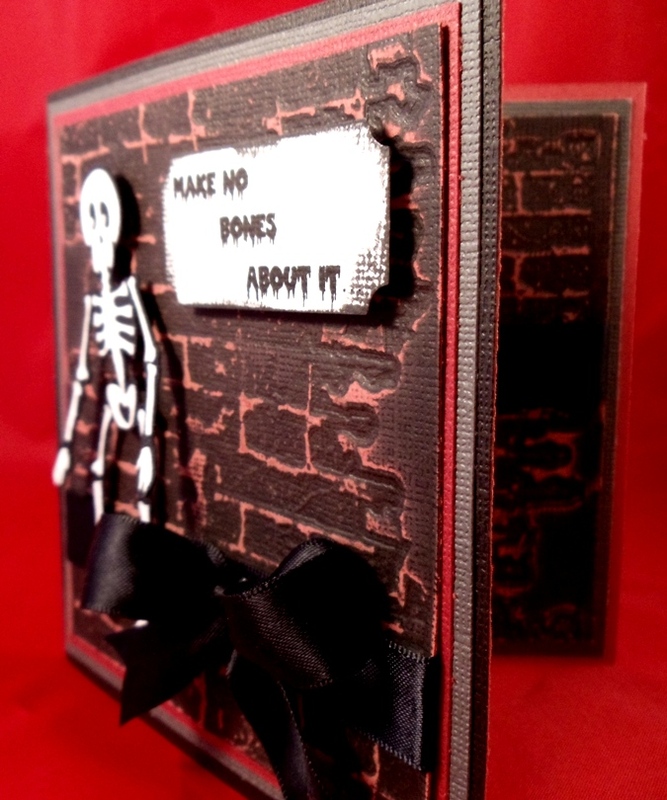 LOVE it, your card turned out so creppy and fun!! Awesome card, I love the embossing. This is just adorable!! I'm a new follower! Nice card, love the sentiment and the colors, thanks so much for the chance to win! Cool card! I love the embossing and the colors. cute card. Love the stamps! Love the pun. Great use of the brick embossing. Your card is too cute! Love it. HAHAHA your card is so funny but it's still perfect for any aged person. What a great idea, Jenny will surely love it. I love it- very well put together. TFS. My goodness this card is so detailed and awesome! I love the brick wall! And the skeleton ia so cute! Very creative way for a bday card!! Cudos for your amazing creativity! Great Card!!!!!! You did Halloween plus Birthday PERFECT!!! I just began following your blog today and already like what I see. Thanks for the chance to win the blog candy.